Many people choose Vinyl Liner Pools over Concrete or Fiber Pools because they initially tend to have the lowest installation price, with a flexible surface making easy to fit into any shape or depth. But one thing that people do not give much consideration or thought to, is how to make it look more attractive. 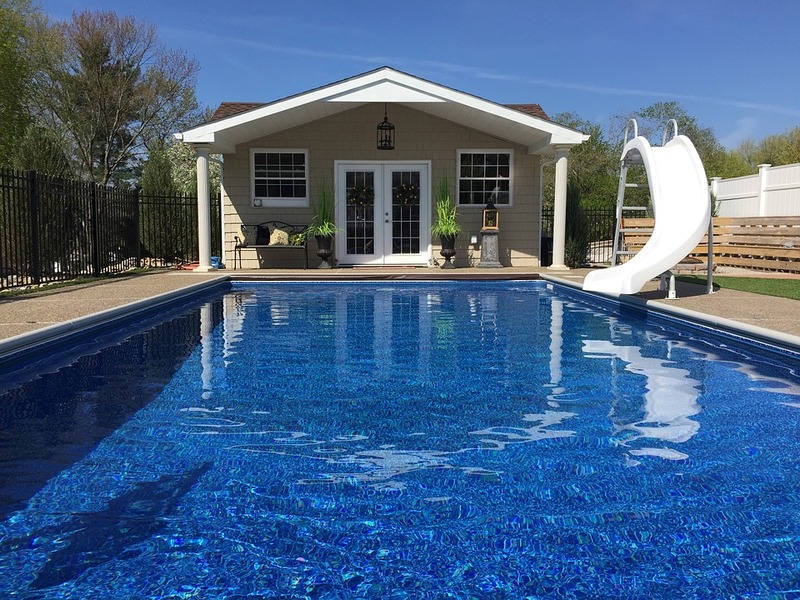 If you are thinking about having a Vinyl Pool installation, then you should definitely consider our recommendations that can make your pool stand out. So how can you actually make your Vinyl liner pool more fetching? If you have already had a pool or are installing a new Vinyl pool then you there are four aspects that you need to pay close attention to, in order to make it look pretty. The standard shape among these options is considered to be the Rectangular shape. Being the easiest shape with regards to its quality of fitting the liner, it has become a prominent choice for people who wish to install their pool on their own. But rectangular Vinyl Liner Pool is non-customizable as they come in a specific shape and size. The best way to make your Pool look unconventional is to break away from the conventional rectangular shape. But not every builder can seamlessly work with free form, so better look for pool builders or pool constructors who have a good experience in working with freeform Vinyl Pools installation. There are three major pool step options for Vinyl Liner Pools. The standard steps that people usually get installed are the Metal Ladder and White steps in plastic. But being a cheaper option, white plastic steps are more common. Metal Ladder costs more money than the white plastic steps but they serve a better purpose. All in all, they both look the same and miss the mark on having a distinctive appeal. So to appeal to the aesthetic senses, try installing Vinyl over steps. You do not need to have an artificial step installed in order to have these steps. The Vinyl pool constructors place the vinyl over the concrete steps and voila you have the best looking steps for the pool. You can easily upgrade from your standard steps to these customizable steps but it involves a cost that can start from about $700 and can increase with the change in design. The steps can be placed adjacent to the pool walls or poll corners while trying different designs for the same. The standard coping that is used often in Vinyl Liner Pool is White aluminum C-channel coping. This half round or bullnose shaped coping is widely used, and bolted as a fixed and stable border, on the top panel of the pool wall. Some people also call it a U-channel. Among these, flat-mount is not considered coping as it is used to secure the vinyl liner. But you can definitely add other extravagant copings on it to make it look beautiful. In Cantilevered coping, a styrofoam is used to give concrete a shape on the edge, much so that the concrete itself becomes the edge. People think that it’s just an ordinary, like a sidewalk, concrete but there is a lot you can do with this concrete. You can color it, stamp it, among many other options. Just like Pool steps, Pools seats also have a standard option of white bench pool seats which are inexpensive but looks inferior. The better option to make your pool look attractive would be to opt for benches and ledges with Vinyl over it. The cost of this upgrade is usually estimated with the Vinyl oversteps. All these seem wonderful to the eyes but just like any other luxury product, Vinyl Liner Pools also need care and maintenance. You should very well know the ‘downs’ to have a Vinyl Liner Pool. Your pets cannot be allowed to walk over the Vinyl surface as Vinyl can easily puncture. The cost of maintenance is high with Vinyl Liner Pools. The pool can easily fade due to the use of chlorine, over the time. Pool Installations are a costly affair and we at Land-con know this very well. Thus, it is important to hire pool constructors who can understand your need and can fulfill your requirement within the given budget. Contact Land-con pool design and build for the best designs on a limited budget. Also Read: Which is the Best Pool Type: Fiberglass, Vinyl, Or Concrete? PreviousPrevious post:Top 10 Amazing Pool Landscaping Ideas for Your HomeNextNext post:To Make Indoor Swimming Pools More Appealing Add Fire Features!